Medical professionals find it difficult to cope up with fast-paced schedules and intense workloads. Despite the rise in patient demand and federal incentives, most practices still use outdated communication systems. They alleviate stress by not being updated with data storage system, client management and smart reporting. Many organizations still do not have a setup to offer text communications, they still rely on phone calls and emails for reminders and are still reluctant to switch to text messaging. When it comes to appointment scheduling, the providers are still hesitant to allow patients to have a full view of their schedule. Also some patients may not be equipped enough to make their own appointments. The patients may not have that kind of medical information to understand how and when they should schedule for an appointment. There are common concerns with the handling of any information over the web, whether it is credit card information, HIPPA concerns or identity theft when communicating with patients online. The text messaging, that is used as appointment reminders offers patients the option to confirm, cancel or ask to reschedule via text. The practice may use multiple options to remind patients but texting is often a preferred method. Also, patient have the option to give their permission to text as their primary method for reminders. Text messaging seems to be the most effective method over phone calls, mails, emails. Generated more appointments – if we know in advance which appointments have been cancelled, giving your practice more time to fill them. Reduce patient communication expenses – it eliminates manual staff calls, paper-work, ink and mailing costs that are required for postcard reminders. Improves staff productivity – it frees your staff to take on other responsibilities, so that they can focus on greeting patients instead of routine calls. There is proper online security and encryption when using web-based schedule platforms, and the patients and the providers can stay HIPPA secured. With this greater convenience, patient staff satisfaction goes up. Having thorough knowledge of utilizing online booking mechanisms, is a part cultivating an optimized clinical presence. The patients are now utilizing the above mechanisms to have higher control with their own schedules. They also save time and understand their health on a more personal level. How does patient reminder help improve office efficiency and health outcomes? Automating patient reminder does have significant impact on how efficiently the front desk operates in your practice. 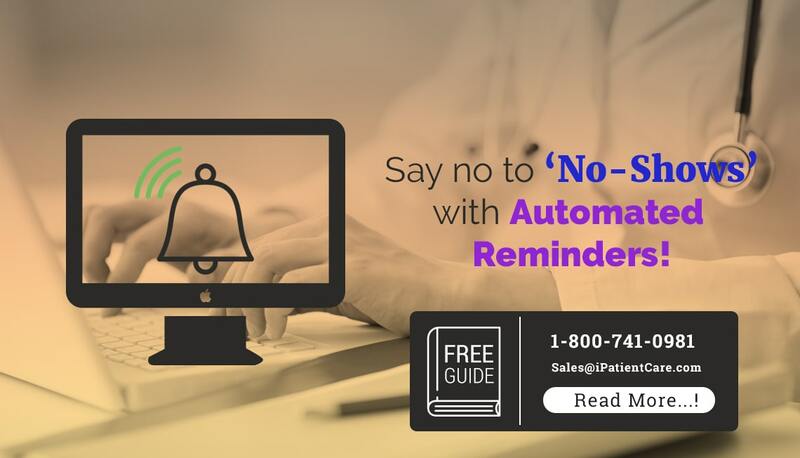 When an automated reminder is sent to a patient, they have the ability to request an appointment right from the reminder message. This notifies the practice to call the patients who are expecting a phone call from you, to assist them in scheduling an appointment. This way it gives lot of time in hands of the staff to focus on more productive tasks. The staff can utilize this time to get to know their patients better, and ensure that high quality care is provided to every patient. A key role in improving health outcomes is the value of utilizing an appointment reminder service to reduce no-shows and late arrival appointments. By sending these automated appointment reminders for a patient’s overdue or upcoming follow-up appointments, ensures your patient’s health is on top of your mind. Assisting the patients to stay updated prevents illnesses and maintains patient’s wellness. Staying connected with your patients through this continuum care is vital to successful health and overall better health outcomes. Sometimes the patients are scheduled for the full day that they do not have any time to respond to their phone. In today’s age most people prefer to communicate via text or email. This type of digital communication allows patients the ability to immediately respond to, confirm, or request an appointment while at work. Automated patient reminders are convenient to both, the practice and their patients. Any organization or business relies on accurate appointment and scheduling. On the surface, these “no-shows” appear slightly inconvenient, but it can have a negative impact on a successful practice. The most apparent impact of no-shows is lost revenue, as that scheduled service no longer occurs. Now, iPatientCare patient reminder system has already reduced no-shows, missed appointments and cancellations by providing tools that meet these needs through an integrated communication system. This is integrated with appointment scheduler and cloud EHR, so there is no need to upload patient demographics and appointments on daily basis. This system enhances patient engagement and generates report on all reminders, allowing easy rescheduling options to choose from. Given such technological advancements, this one-time burdensome process is now simplified through an automated scheduling system.